We’d love your help. 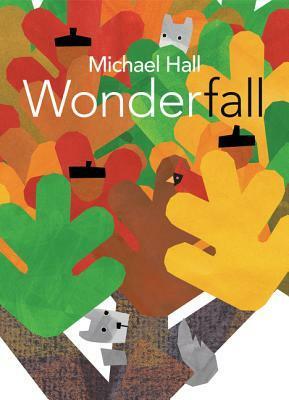 Let us know what’s wrong with this preview of Wonderfall by Michael Hall. This beautiful and informative picture book follows a single tree through the fall season, from the end of summer to winter’s first snowfall. A great read-aloud for home and the classroom by the New York Times–bestselling creator of My Heart Is Like a Zoo and Red: A Crayon’s Story. Wonderfall follows a single tree through the changing of the seasons. People, animals, and ve This beautiful and informative picture book follows a single tree through the fall season, from the end of summer to winter’s first snowfall. A great read-aloud for home and the classroom by the New York Times–bestselling creator of My Heart Is Like a Zoo and Red: A Crayon’s Story. To ask other readers questions about Wonderfall, please sign up. I adore this book. With it's charming art work reminiscent of Lois Ehlert and Eric Carle, this tale delights readers with how our world transforms from summer to fall. A truly accurate description for any nature lover. Such mini-episodes work together extremely well to capture the spirit and progression of fall. And the twist at the end is simply perfect! Plus, I really liked the final pages with interesting information on the way different animals, birds and trees prepare for the upcoming winter. Each page topped by a word changed to include fall, followed by a brief description/poem. Went over well at story time. It's books like this treasure by Michael Hall that make me want to take a step back and really evaluate my children's writing. I tend to focus heavily on dense, complex stories when my first love was poetry for children. I am a huge lover of Autumn and Hall's journey from late summer to the first snowfall was bittersweet but wonderfully done. I also thought the animal descriptions at the end of the book were a nice touch. Fun book about autumn. I appreciate the last few pages that explain the different ways the animals seen throughout the book prepare for winter. However, I do wish more of that information had been integrated into the story instead of just at the end. Ode to fall from the point of view of an oak tree, almost like a collection of poetry. Love the end matter, love the art. Be sure to look at the case under the dust jacket. Where was this book a month or 2 ago - need to remember it for next fall. In a series of poems, this picture book celebrates the changing seasons through the experience of a tree. First in the greenness of summer, the acorns start to fall from the oak tree. The yellow school bus arrives and the tree’s leaves start to change. Harvest time arrives, parades march past, and Halloween comes.The leaves start to fall, Thanksgiving comes and children play in the piles of leaves. Wind arrives, taking most of the leaves off the tree and its time to rake. No leaves left, the tre In a series of poems, this picture book celebrates the changing seasons through the experience of a tree. First in the greenness of summer, the acorns start to fall from the oak tree. The yellow school bus arrives and the tree’s leaves start to change. Harvest time arrives, parades march past, and Halloween comes.The leaves start to fall, Thanksgiving comes and children play in the piles of leaves. Wind arrives, taking most of the leaves off the tree and its time to rake. No leaves left, the tree stands bare until snow comes with the new winter season. 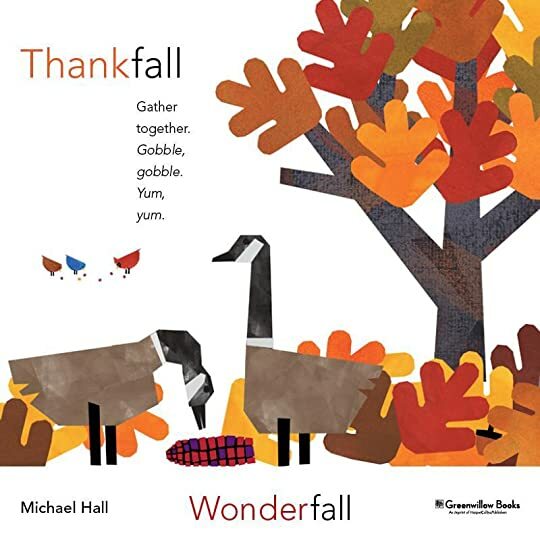 Hall celebrates the autumn season with this picture book that encompasses the very beginning signs of autumn all the way through to full winter. The focus on a single tree as the one experiencing the changes works well, particularly with the vivid changes that the tree goes through itself. It is also interesting to see trees as witnessing what humans do just as they watch the activities of the squirrels on the ground and in their branches. The book ends with information on animals seen in the book and how they prepare for winter. The illustrations are signature Hall with bold shapes done in collage. The leaves are oversized and glorious, full of bold colors and the size of branches. They enliven the page no matter their color, making the winter pages when they are gone all the more cold and barren. Perfect book to read for the fall! Enjoyed seeing all of the words with -ful that Hall changed into -fall. Autumn poems are a delight to read. Two gray squirrels tell the story on the great adventures, traditions and changes of fall. Fall can mean holidays, back to school, leaves falling, harvesting, foods and more. Wonderfall connects the activities from the season with the different feelings that fall will give us. This book may even give you a new idea of what fall means to you! The end of the book also has some fun facts about fall critters and how gray squirrels live during fall and prepare for winter. The activity will begin with a tree trunk with branches, no leaves. We will add leaves to the tree, but on each leaf we will write things we want to accomplish this fall to make a great start to the year. This can be goals for school, home, personal, friendships, activities, anything. Once completed we will talk about ways we want to be SucessFALL in this classroom, what we want to learn, what we are going to accomplish and how we will have fun doing it all. Sometimes I wonder if Michael Hall puts a bunch of things in a hat, shakes it around, and then writes a book about it. We've got seasons, we've got animals, we've got poetry, we've got wordplay, we've got story, we've got facts... there are a LOT of ways you could use this book in an educational setting. My issue could be a nitpicky one, but I feel like the wordplay feels more forced than clever at times. Contrast it to Cat Tale, which is Hall's clever whimsy at its best. Love how this story is written in verse and it uses the word "fall" on each of the pages to describe how the tree transitions from fall tree to the beginning of winter. Great book for prediction work. My students quickly picked up on the idea that the words would end with "fall" and tried to predict what it would say using clues from the book. They also enjoyed the non-fiction facts in the back of the book, we searched to see if the squirrels were looking for their acorns they had misplaced. Enjoy the season from the tree's point of view. Each double-page spread captures an aspect of the season in a column of verse and often some onomatopoeia (sound words). I mentally applauded with each choice of "full" words selected to become "fall" words. PeaceFALL, DutiFALL, PlentiFALL, BeautiFALL, and so forth. At the end of the book there are informative pages about animals featured in the illustrations "getting ready for winter" and finally more about the deciduous tree. "Wonderfall" is a departure from Michael Hall's other works, as it is a collection of poetry. The wordplay is clever, and the bright, primary-colored illustrations will likely captivate young readers. The inclusion of nonfiction information at the end of the book is unexpected and could be utilized by teachers to introduce changes in seasons. I enjoyed reading this book for a fall storytime. Love the clear bright illustrations. The pictures of different animals were a delight to the children, including the young toddler whose comment was "we shoot them". Obviously a hunting family! This book is a collection of poems showing the fall season from the point of view of a tree. My kids liked the play on words. For older preschoolers and young elementary students. It may be a tad long for young toddlers, but they may enjoy the pictures. I love how the author plays with blending words in the story. A simple concept, and it works. The illustrations are colourful and really fill up the page, helping young readers follow along while older kids read the words. Even as an adult, I love this! I love the play on words, the colors, the illustrations. The whole book is enjoyable and pleasing to the eyes. It also includes some educational information in the back of the book. I really don't like the concept for this book. I realize I'm in the minority on this, but I have a hard time getting into Michael Hall. Another delitfall picture book from Michael Hall. Gorgeous and vibrant collage illustrations paired with a play-on-words poem dedicated to the most colorful season of the year, Fall! Great fall book and loved the play on words throughout. Beautiful illustrations. Great for all ages. Used for seasons storytime theme because of the bright colors and poetic words, but didn't work as well for storytime (especially with a younger crowd). Uses wordplay on the word Fall/full to vocalize the happenings during the season as a tree witnesses the neighbourhood from the end of summer to winter. This is about an oak tree getting ready for winter. Would have been 5 stars except that I didn’t like how it couldn’t decide whether it wanted to be a rhyming book or not. Michael Hall is the author/illustrator of The New York Times bestseller, My Heart Is Like a Zoo, as well as the critically acclaimed Perfect Square, It’s an Orange Aardvark, Red: A Crayon’s Story, and Frankencrayon. Before becoming a children’s author, Michael was an award-winning graphic designer whose work — i Librarian Note: There is more than one author in the Goodreads database with this name. Before becoming a children’s author, Michael was an award-winning graphic designer whose work — including graphic identities for the City of Saint Paul, Macalester College, the Minnesota Historical Society, and the Hennepin County Medical Center — has been widely recognized for its simple and engaging approach.